Allen the Alligator captured by Galvin Wildlife Control. An alligator who caused a bit of a scare Friday in Allentown's Lehigh Canal has a new home at an animal preserve in the Poconos. An 18-year-old fisherman spotted the 4-foot gator's scales along the surface of the water and notified Galvin Wildlife Control in Upper Macungie Township. 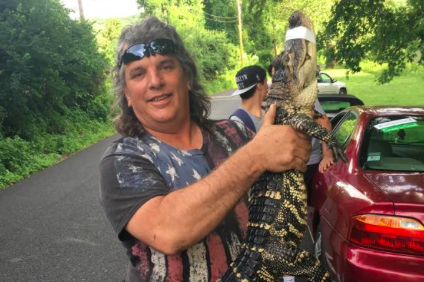 Keith Galvin Sr., who has run the family-operated business for 20 years, told Lehigh Valley Live that the gator was found in healthy condition and appeared to be well-fed. He was captured using heavy duty fishing tackle after a hunt that lasted several hours and involved local police. "Somebody realized, when they get to be a certain size they're not a cute cuddly pet," Galvin joked. On Monday, the gator, named Allen, was taken to Pocono Snake and Animal Farm in Marshall's Creek. Wildlife experts described Allen as a juvenile who isn't native to the area, but that doesn't mean you should punt your fears to a future Everglades trip. Climate change could increasingly entice gators back into the mid-Atlantic or further north, where they've been at various stages over more than 200 million years of evolution and planetary change. Allen will now reside in the neighborly circle of some mini gators and Sluggo the Sloth. Nice work done by everyone involved.